Coachella is to the summer what Fashion Week is to the fall and winter seasons. It’s the all-inclusive event that sets the tone of what’s to come for summer style. From Instagram photos to paparazzi shots, attendees give a comprehensive trend forecast, sometimes unknowingly. So what was the hottest trend? Western, of course! From Kendall Jenner to Gigi Hadid, all of Instagram’s It girls strutted around in their best Western-inspired looks. The common denominator amongst all of those aesthetically-different looks? The brand Ganni, which was widespread all over the festival. Looking to steal their style but in a more practical way? This denim dress with a hint of Western is the perfect addition to any and every closet! 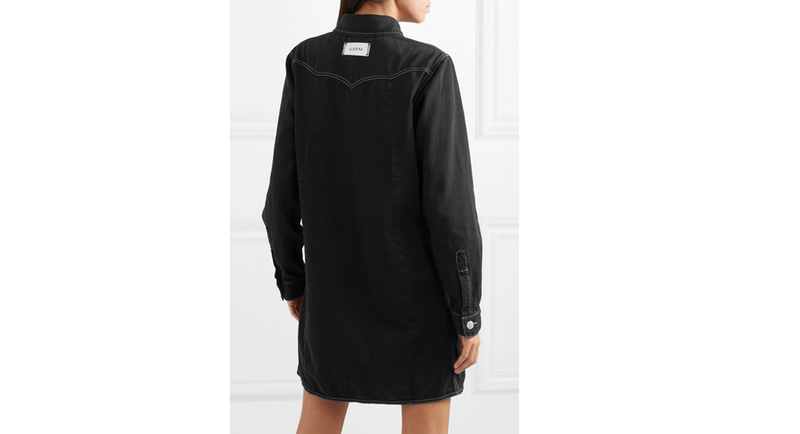 See it: Grab the Ganni Denim Dress for $280 available at Net-a-Porter! Who said we had to travel to the wild wild west to dress like it? 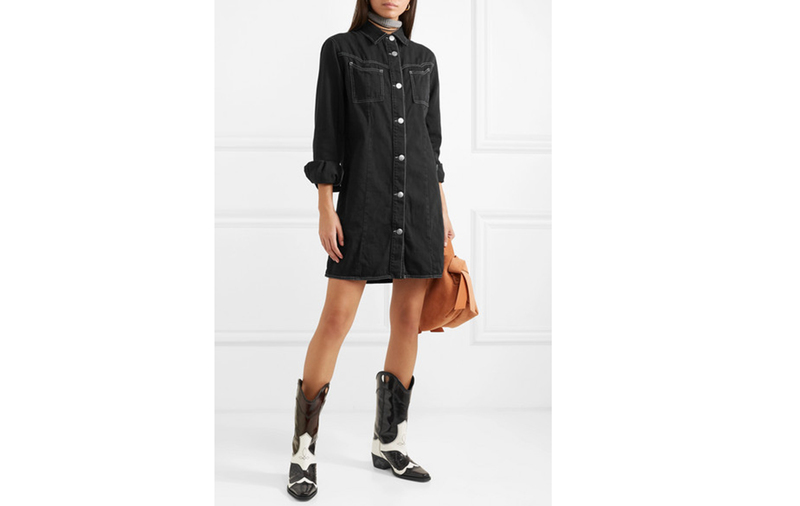 The Ganni denim dress is the perfect piece when looking to get in on the Western-inspired trend in an understated way. Constructed from black denim, this silhouette is sleek and features a white stitching detail throughout that is not only subtle but swoon-worthy. It’s perfectly paired with equally sleek silver buttons that make this dress easy-to-wear. Personally, we were instantly drawn to the button detailing, which is the most important detail of this entire look. Often times, we overlook buttons on a piece of clothing because buttoning up or shirts, pants or dresses is just a routine step that’s more function that fashion. After all, buttons serve one purpose: To close a top or bottom from opening. Oh, how wrong are we here! When it comes to these buttons, they serve such an important role and a higher purpose in their styling capabilities. Looking for the most conservative look of them all? Button this dress to the top and add a thin neck scarf. Talk about endless chicness! Not your style? No problem! Go ahead and loosen two or three of the buttons. Add some gold jewelry or maybe even a thick double-buckle belt or even a crewneck T-shirt underneath. Suddenly, the dress looks completely different. As we said, it’s styling capabilities are honestly so endless here. It’s not just Us who love Ganni and the Scandinavian brand’s trendy pieces. Gigi Hadid, Kendall Jenner, Kylie Jenner and even Emily Ratajkowski were all spotted rocking the beloved brand throughout the first weekend of Coachella. Looking to recreate some of weekend one’s best looks? Slip into this dress and add this pair of cowboy boots, just as Kendall Jenner did! Looking to dare and bare a bit more? No problem, either! Slip into this pair of tie-dye jeans and match with its matching crop top, as Kylie Jenner did. Completely unbutton this denim dress and wear it over as a denim jacket. As we said, it can be endlessly styled. While we may not choose to rock a tie-dye vest like Hadid or oversized jeans like Kylie Jenner, this denim dress is the error-proof option when looking to steal their style. Simply pair with your usual accessories for a hint of cowgirl. Whoever said we had to actually attend this fashion festival clearly has not been keeping up with their Instagrams. If they had been, they’d know that this denim dress is the ultimate option when looking to stay on trend and make real life a little more like Coachella. Not your style? Check out additional Ganni options and even more dresses also available at Net-a-Porter!